On 27 December, the Japanese 3rd, 6th, and 40th Divisions massed at Yueyang and advanced southward in three columns and crossed the Xinqiang River, and tried again to cross the Miluo River to reach Changsha. However, the Chinese formed a deep pocket around the city and set up ambush parties around the Liuyang River. Halfway from Miluo River and Changsha, the Japanese columns faced strong resistance from the Chinese and the eastern column was forced to take a detour further east, and the other two columns had to move closer together than originally planned. During the southward advance the Japanese encountered three Chinese army divisions that were pushed aside but not crushed; they retreated into the eastern mountains. 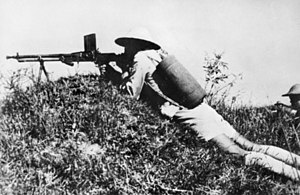 The besieged Japanese then attempted to retreat across the Liuyang River, not knowing that an ambush party was already stationed in the region. Losing heavily at the river crossing, the Japanese eventually reached the Xinqiang River on 15 January to complete the retreat. The third Battle of Changsha can be thought of as decisive. Just a month after Pearl Harbor and U.S. entry into the war, the battle was acclaimed to be the only major Allied victory of the Asia-Pacific theater in late-1941/early-1942. It was seen as a major victory and opened the possibility that the Chinese could turn the tide of the war against Japan. It earned Generalissimo Chiang Kaishek's Government much prestige from abroad and legitimacy in China. Xue Yue earned himself more prestige in China for his three victories and outstanding tactical skills. Changsha would remain in Chinese hands until 1944. ^ Japanese Monograph No. 71, Army Operations in China pp. 76. ^ "APOD China: The Third Battle of Changsha in January 1942 Forum". Yuku. Retrieved 31 January 2016.